These are the directional chutes upstairs in the Elevator. 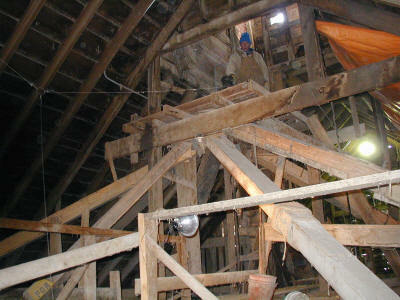 Grain was carried up to the cupola via a conveyor and dropped into a spout that could direct the grain to a particular chute and thus a desired bin. At one time there were 24 bins approximately 9X10 and 13 feet deep. Twelve of the bins have been removed. With each bin holding approximately 1000 bushels and a bushel of corn weighing 56 pounds, that would mean there was 56,000 pounds in each bin. If the 24 bins were all full, there would be 672 tons of grain. In a Bangor Reflector article of March 1883, the Elevator was said to be full to capacity with 670 tons of grain insured for $20,000. 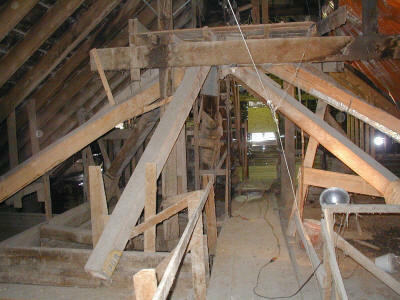 The chutes have been numbered for future reference and removed so work can be done on the structural stability of the cupola. A catwalk runs from north to south on top of the bins so there is access to the bin openings. The orange seen at the edge of some of the photos is a large tarp strung out across the east side of the roof to catch snow and water that falls through the hole in the roof. Looking north from the south end. 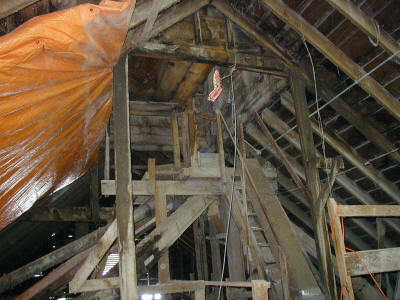 Looking south toward the stairs to the cupola. 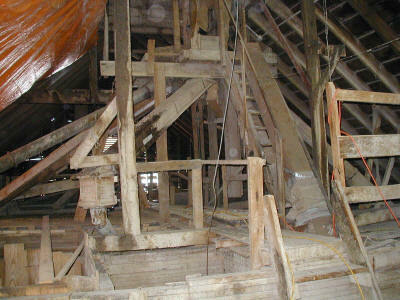 Looking into the cupola from the north. 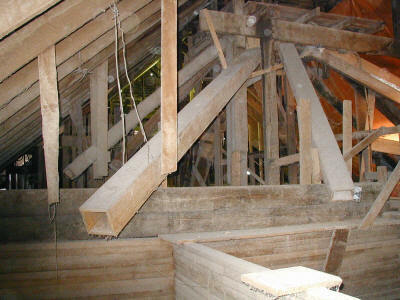 Looking into the cupola from the south. Chutes aimed to dump into a bin.